At 8am, whilst queuing outside the Magic Kingdom, patiently waiting to get in (in July, if you don’t go early -> LOL) I noticed people were bypassing the queue, looking decidedly smug and getting into the park. 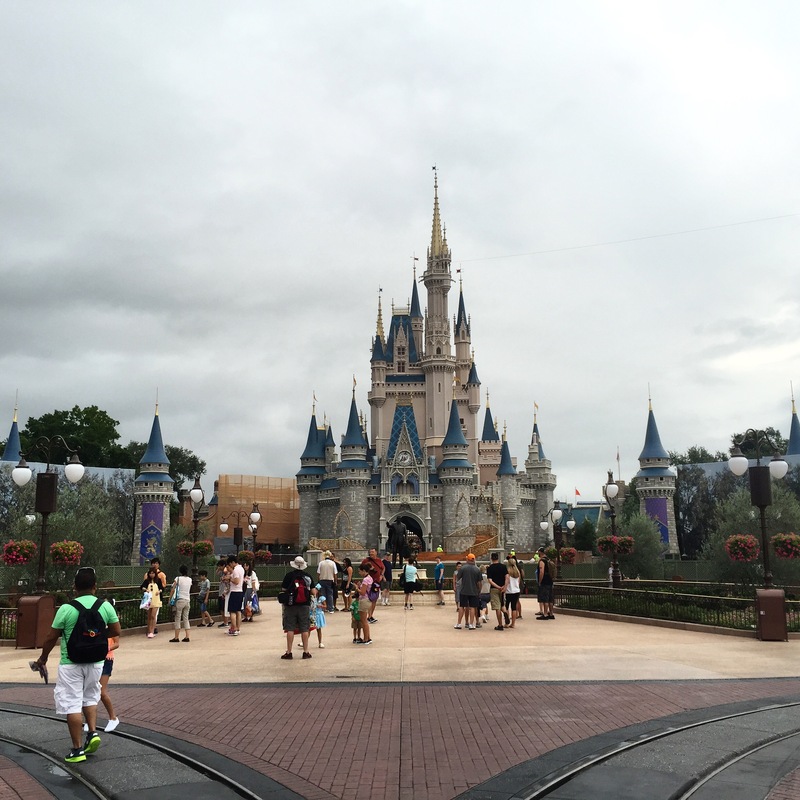 There were no magic hours scheduled for today? What powers did these people have? Were they celebrities? Or Disney’s grandchildren? No — it turns out that they were savvy enough to make breakfast reservations and thanks to their smarts, could skip the lines, enjoy a sit-down breakfast and then swan about the park at their leisure. Very few people know about this tip. 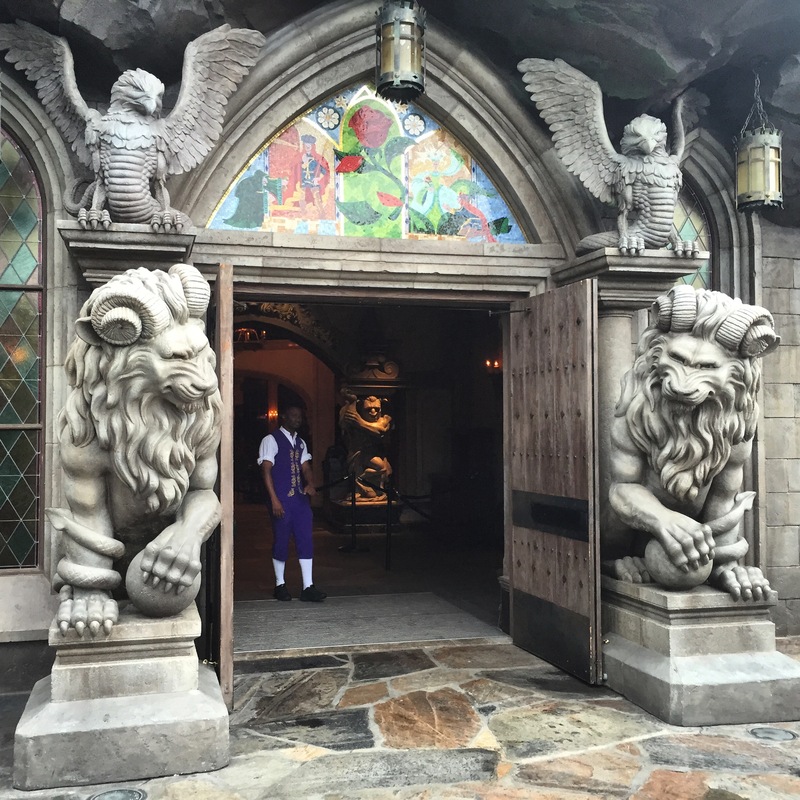 Obviously breakfast was booked at “Be Our Guest” — the new, themed restaurant in Fantasy Land, as soon as I got home. The early morning reservations are like gold dust, but if you keep trying you might get lucky. On Monday morning, I waved the reservation around, skipped all the queues and became that decidedly smug person. 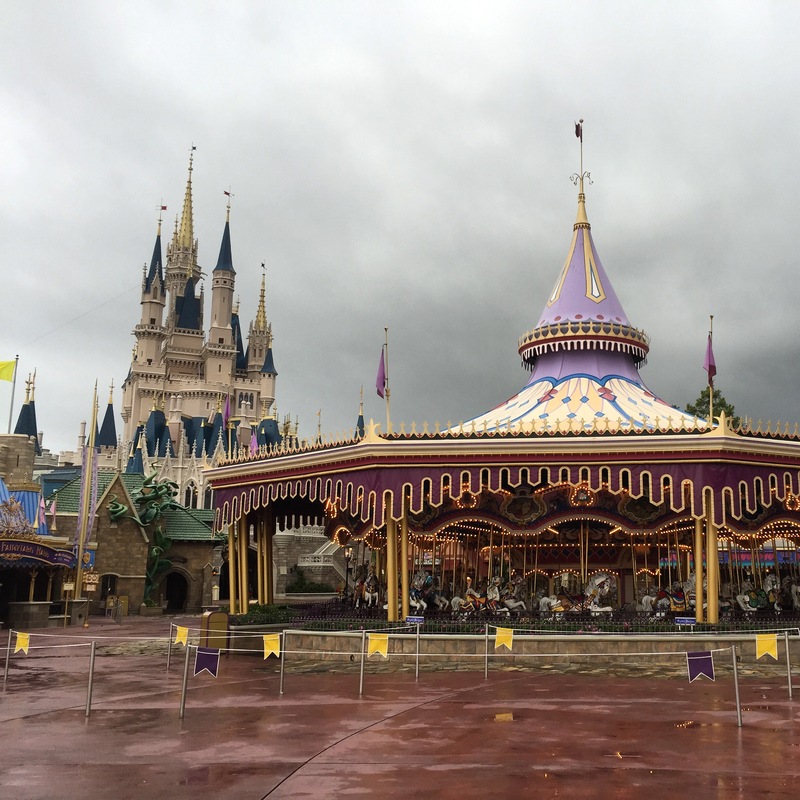 The park was eerily, eerily quiet — if you’ve been to Disney World, you’ll understand how rare it is to have a photo with no one else in it. Also, notice those puddles and ominous clouds? I was thrilled to be able to go indoors and not stand outside in my terribly fashionable poncho. Later on however, I became best friends with it. It was the only thing separating me from buckets of water falling from the sky. On arrival at the castle, you are shown into a room, where you order your meal (don’t forget to look at the beautiful stain glass window to your left as you enter) and once you’ve paid, you’re directed into the ballroom. Unexpectedly the cashiers weren’t too friendly or helpful, and this was a bit of a let down. Besides the unDisney-like ordering experience, the castle is beautiful and no detail has been spared. 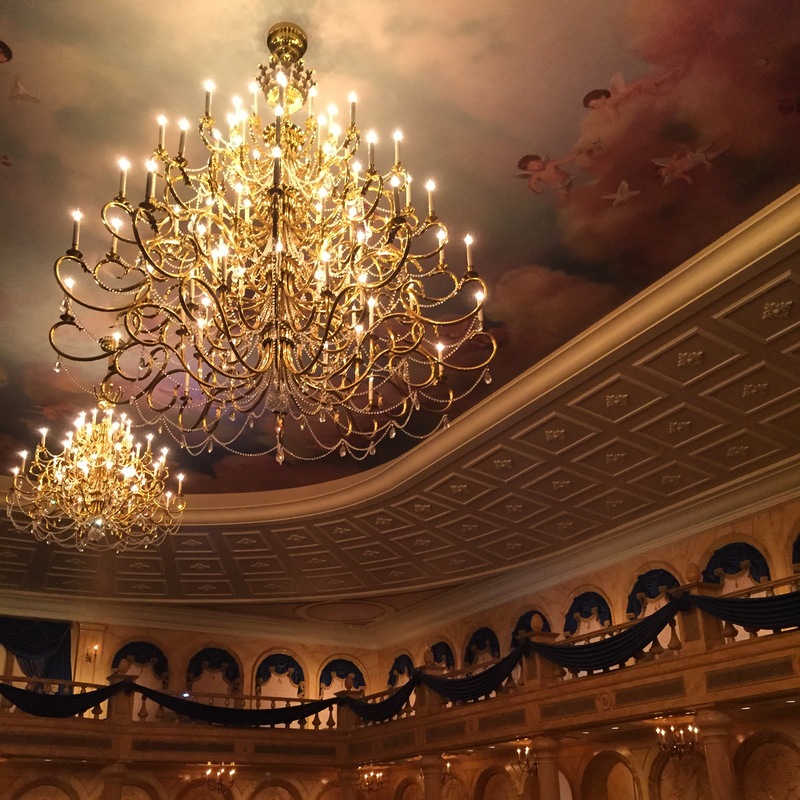 The ballroom is 9 year-old-me’s equivalent of heaven with ornate chandeliers overhead and snowflakes falling on the giant arched windows. Whether 7 or 27 (ahem) you’re guaranteed to feel like a princess. There are 3 separate dining areas and you’re allowed to see them all and take pictures. The West Wing is beautifully done, but I wouldn’t recommend eating in there as it’s very, very dark.The breakfast menu is pretty decent for a theme park — let’s be honest, they’re not famed for their culinary prowess. You can see all the options here. 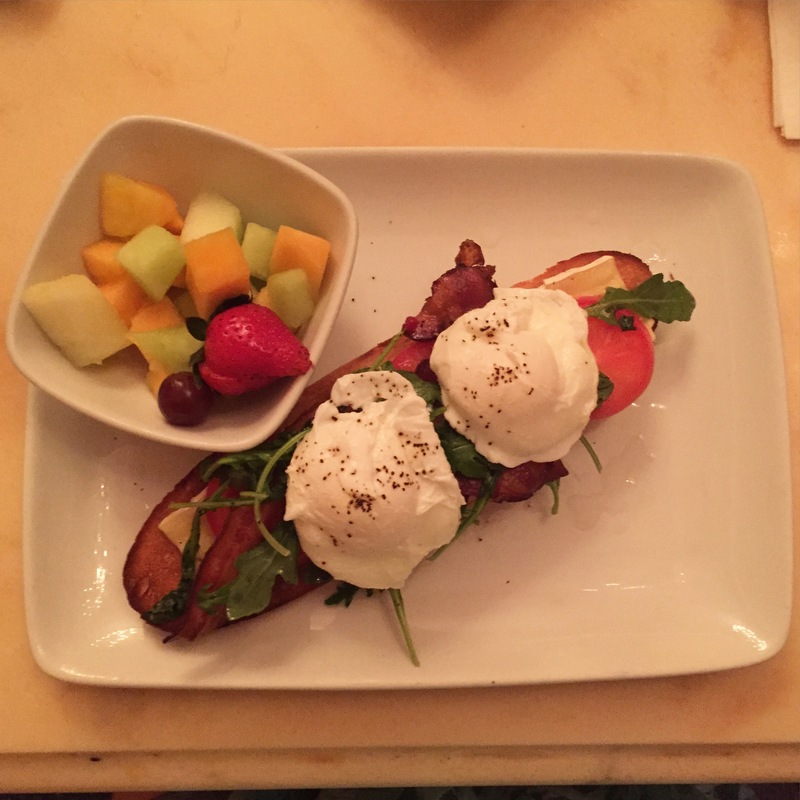 And yes it’s completely over-priced, but honestly what were you expecting?I went for the open toasted sandwich with bacon, bree and poached eggs. It arrived with a cup of fruit and each table gets a free (can you believe it?) tray of tasty pastries. Highly recommend getting a breakfast reservation (between 8–8.10AM) — it really beats waiting outside the park (especially if it’s raining). Make sure you’re done by 8.45 AM, as sometimes Disney opens the park a little early and you don’t want to get caught out. After breakfast, head straight for the 7 Dwarves Mine Train — their newest and most popular ride. It’s right next door to Be Our Guest and after 9.30 the wait time doesn’t drop below an hour. practical stuff— obviously this tip doesn’t work for extra magic hour days, where the park opens at 8am. You can book your dining reservations by calling, or on the My Disney Experience app and you can make them as soon as you have your tickets. Book your tickets online and make your reservations as far in advance as possible. They have a 24hr cancellation policy and you can cancel using the app if you need to. You can find all the official info here, on their Disney page. This blog isn't updated all that often. It's a collection of posts about marketing, travel and trail running.